GR Solaris Cancun is amid the most respected luxurious hotels in the Mexican Caribbean, with an outstanding reputation and a magical ambiance that will glow upon you from every direction. 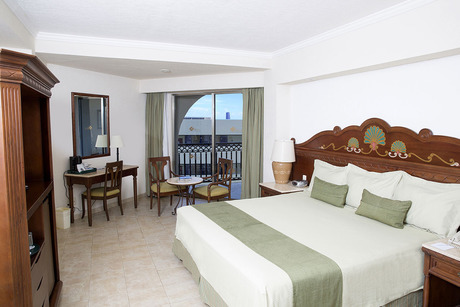 GR Solaris Cancun it's the ultimate in family entertainment, comfort and service. 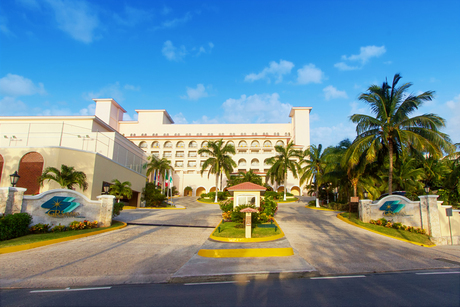 Located in the Hotel Zone of Cancun, a beachfront resort with more than 306 gorgeous rooms with elegant mexican decoration, with your choice of one King size bed or two double beds. The rooms are also available with terrace or balcony having breathtaking views to either the Nichupté Lagoon or the azure waters of the Caribbean, some equipped with a jetted tub to relax in open air. The accommodations are perfect for a romantic honeymoon or a simple escapade with your significant other, away from routine. All your meals and drinks are included on your reservation and the variety of flavors is wide! GR Solaris features 5 restaurants, each with their unique cuisine specialty. Enjoy every morning the best vacation breakfast ever at Café Solaris. Savour your meal in front of the wonderful Caribbean Sea at Rosmarinus restaurant, featuring Mexican specialties, vegetarian, italian and other international dishes. Picture yourself here already, having a great time under the sun of Cancun with your family at the acclimatized pool, simple activities that build the best memories and strengthens family bonds. Leave your children at the Kids Club where their friends from the staff will make their time the most awesome of all with supervised fun indoor activities or splashy games at its mini pool, while you enjoy a relaxing or romantic time with your special someone at the adults only pool with jacuzzi. Contemplate the beauty of the sea: Admire every day of your stay the breathtaking views from the balcony of your room. All the rooms in GR Solaris feature impresive views from the balcony. Enjoy a time breathing fresh air and feel the ocean breeze in your face. Relaxing Pool: Take a well-deserved time to relax away from the bustle in the relaxing pool area for adults in GR Solaris Cancun. Just forget about everything and surrender to tranquility. Besides video games your kids can also enjoy children's movies while having delicious and nutritious snacks like nachos, fruit and vegetables. If they prefer to create something, your kids can take out all their artistic potential through arts and crafts. They will learn to create piñatas, key chains and other useful objects that can take home as mementos of their wonderful vacation. The friendly staff mates will care for and provide advice to your children during the daily activities program, which includes daily walks by the beach and pool areas, relay races and Tournament of Darts, table tennis basketball and other games. To get more out of their vacation, the entertainment team will give your children a different theme each day, so every day will be a totally new adventure for your kids to enjoy throughout the week. Open from 9:30 a.m. to 5:00 p.m. Facilities suited for children from 4 years and older. A new place where our youngest guests will enjoy this special area for the kids. This new colorful playground area allows them to have fun while on vacations in Cancun. Opens daily 24 hours. From 0 to 4 years old. Parents must be supervising their children at all times. Spa: Find tranquility for your mind and body at the same time your skin gets healthy and beautiful. GR Solaris features a hollistic Spa in Cancun to bring balance to your body, mind and soul. Feel radiant, full of life with our complete spa sessions, which include mud body wraps & natural masks. Nourish your skin and say goodbye to skin and face imperfections. GR Solaris features 5 restaurants with delicious flavors for the delight of all guests with the distinctive high quality of the Solaris all inclusive resorts. Family vacations are not only fun but also tasty! Know the variety of the dishes, you will love the experience bite by bite. 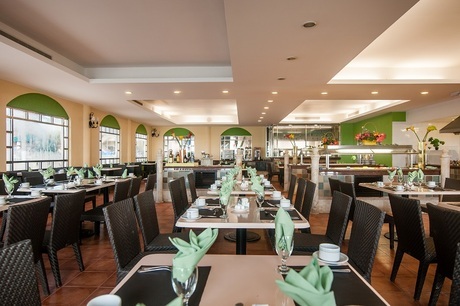 Cafe Solaris: Join them every morning at Café Solaris for an international breakfast buffet. You will be catered by their friendly waiters, feel comfortable and enjoy the delicious dishes of the bar. You may also have eggs made your style and the American and Mexican breakfast favorites. Bon appetit! Rosmarinus: Featuring a great selection of hot and cold entrees, juicy steaks, fresh crispy salads, vegetarian and low carb food, Mexican dishes, and incredible desserts, Rosmarinus international buffet is the place to have an unforgettable tasty lunch. The sea side Restaurant will strike you with its views, its atmosphere and its flavors. ZAI Oriental Restaurant NEW! : Enjoy the best of the oriental cuisine, Thai, Vietnamese and Japanese, in a casual atmosphere and with beautiful views of the garden and pool areas. Opens twice a week from 5:30 pm to 9:30 pm. Reservation is required. A la carte restaurant. Dress code: Casual (shorts are not allowed, beach sandals or bathing suit). Marco Polo: The International gourmet restaurant in GR Solaris with a different style of cuisine every night, it's one different specialty every night of the week! Go and try the culinary art of the chefs in a comfortable atmosphere and the warm treatment of the staff of all inclusive resorts. Family vacations made memorable with high quality service and taste! Deli: The option for night owls. Open from 4:00 p.m. to 6:30 a.m. Enjoy subway sandwiches, a variety of cheeses, cold cuts, salads and soft drinks in a relax & casual atmosphere. Great option after a clubbing in Cancun. Pizzeria Le cinque terre Pizza: Enjoy delicious homemade pizzas including vegetarian and classic flavors. Menu is available or create your own pizza with the assorted toppings. Opens daily from 12pm to 6pm. Snack Bar: Get close to the snack bar by the pool area, it's open from 11:30 a.m. to provide you all the snacks and drinks you can have. French fries, chicken nuggets, hamburgers, hot dogs and frosty beverages among others dishes are served daily for your enjoy. Swim up Bar: Savor frosty cocktails, tropical drinks, non alcoholic beverages and more, right within the pool. 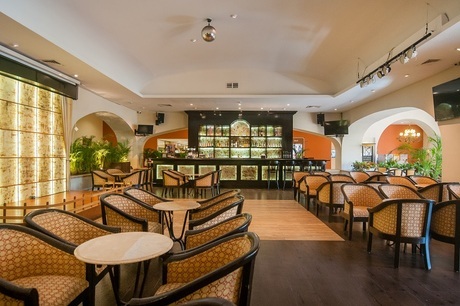 Lobby Bar: Go and enjoy a drink while you listen to different music genres or watch a sports match on the T.V. They serve freshly brewed coffee every morning, you can check you e-mail or your Facebook with their free internet access, while you sip your coffee, getting prepared for another vacation day in Cancun. When you are in Cancun, every day is a new adventure and no day is like the other. They have activities all day throughout the week for those who prefer more active holidays: From Yoga, stretching, beachcombing, pool sports, table tennis, even fashion & casino nights. The evenings in GR Solaris also wear different colors throughout the week, making your evenings in unique theme nights. Every night the Tehuacan Theatre presents a different theme in both the menu and on stage, you'll enjoy the whole experience with Caribbean dishes surrounded by the typical Latin atmosphere. Meet dance around the planet Earth through history, and you may find out movements you didn’t know possible. The nights include magic shows and also tributes to stars of the music world and even karaoke nights. Not afraid of heights? Try the new and exciting climbing Wall “HUE HUE” at GR Solaris. Named after a famous hill located in the volcano path in Puebla, México, this fun for all wall is 13 ft high and 21 ft long. Kids and adults are welcome. Check the operation schedule upon check in at guests services, front desk or with the entertainment staff. GR Solaris Cancun & Spa is an amazing Cancun lodging choice for your trip to Mexico. With numerous amenities for guests such as room service, children's play area, 24 hour front desk, you will wake up at GR Solaris Cancun & Spa feeling refreshed every day for your time in Cancun. Don’t let this amazing reservation opportunity pass you by, book your stay at GR Solaris Cancun & Spa today to make the most of your time in Cancun, Mexico.